Everyone deserves a bit of downtime and relaxation. 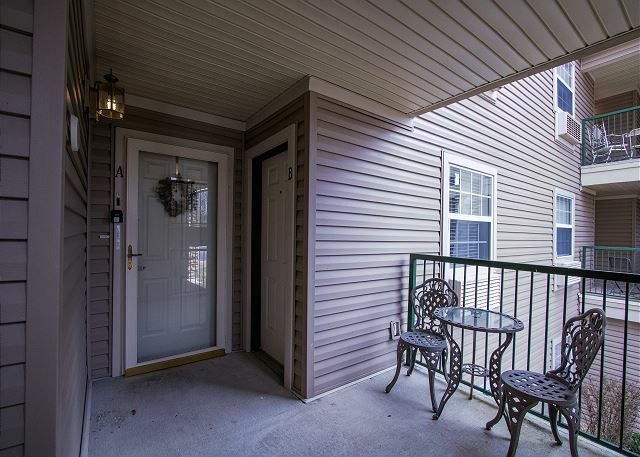 Make yours better than ever when you book this lovely condo! 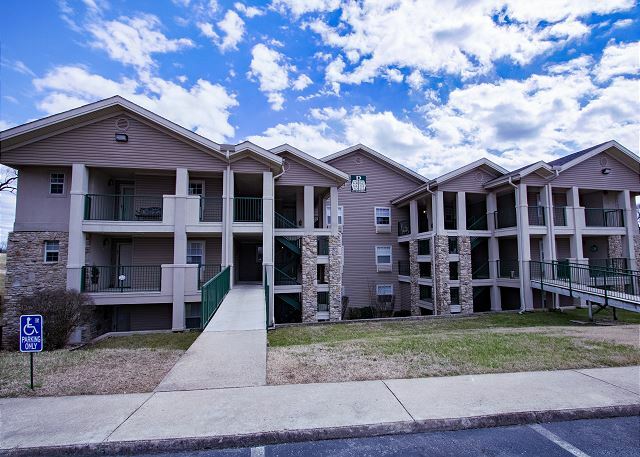 Located in the fantastic Holiday Hills resort, this unit is only moments away from some of the best places Branson has to offer. From the Branson Landing and Historic Downtown Branson (nestled right beside Lake Taneycomo), to the Branson Strip only a few more minutes away, you are right where you want to be for a wonderful Ozarks experience! But the truth is, you don't have to even leave the resort to have a fun-filled day! Holiday Hills has tons of amenities for you to experience. With three different community pools, tennis and basketball courts, a catch-and-release pond, and even a golf course, there is something everyone in your group will love to do! Of course, a vacation is only as good as the place you rest your head. Worry not, because this condo is a perfect place with a perfect price! Take a breather and watch your favorite show on the flat screen TV, complete with cable and HBO. Check your Facebook and email in your down time: wi-fi is completely complimentary. When you start to feel hungry, whip up something tasty in the full kitchen, and don't worry about leftovers… There's a full sized fridge at your disposal! 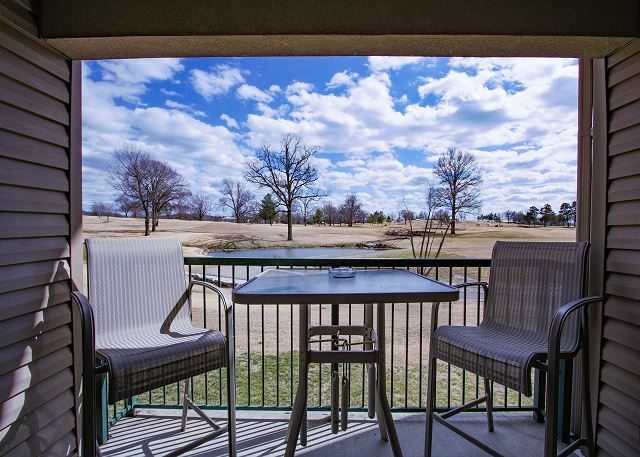 When you want to wind down, take a seat on the private balcony and take in your own view of Holiday Hill’s Golf Course’s Hole #2 as the sun sets on a marvelous day. Condo was clean and spacious! Staff at Sunset Rentals was very helpful and accommodating. My family (2 adults and 2 kids) stayed here for spring break and had a great time. About 3 miles from Branson Landing. This rental is across the parking lot from the indoor pool and gaming center. There is a shopping center with a Dollar General and Pizza across the street. Would recommend! Thank you so much for this great review, Marjorie! We love hearing that your family had such a great time. We can't wait to have you stay with us again! this was the second time we stayed with holiday hills, and we intend to use them again when we return to branson. both condo's have been everything promised and are located perfectly! We love seeing reviews like this! Thank you so much for the great feedback, David. We can't wait to have you stay with us again on your next Branson vacation! Overall we had a good experience, the condo was nice, a few things could be updated. On our second and third night there, our upstairs neighbors stomped around until midnight which was very annoying. My credit card was charged twice by the property management company, it was corrected when I called them, although it stayed on my credit card as a pending charge reducing my credit line for a week. We had a great time in this unit. If you enjoy golf, this is your spot. There are a few items that should be upgraded, but all in all, it is fine. Nice to have all the space to enjoy. Bob and Denise, we are so glad to hear that you both enjoyed your stay! We hope that you will come back and stay with us again soon! Excellent condo and reasonable rates. I would definitely stay there again. Donna was so helpful at Sunset with any questions I had and getting contracts and info to us. The Condo was rally great! Clean and so much storage and space. It was great that the swimming pool was just across the street. Thank you for the review, Sheila. We're glad that we could help your family find the perfect place to stay and that you enjoyed the accommodations! We had a great time at this lovely clean condo. We were very happy with not only the condo but the activity center being so close. I would recommend this condo and would use it again. We stayed for a girls weekend trip.loved the cozy condo in a great location. only problem was a big stain on the carpet when we got there and it kinda smelled like maple syrup. Hi, Julie! Thanks for your review. We're glad that you had a nice stay, and we apologize about the issue with the carpet. We will be taking care of that immediately, although it's a good thing it at least smelled nice! ;^) We hope to see you again in the future, and we have a special returning guest discount waiting for you when you're ready for another Branson vacation! Overall we were quite satisfied. Unit was clean and inviting. Easily accessible as per the instructions. A very pleasant atmosphere and view. Many "extras" from a contents stand point, dvd's, tapes, a few books, a few golf clubs, sports racquets etc.As for things that could have been better, we were only provided one bath towel, washcloth, face towel per guest. We felt this was insufficient for a four night stay.The coffee maker malfunctioned 2 out of 4 mornings, overflowed the "grounds basket" resulting in grounds and coffee all over the counter and undrinkable coffee. A $15 item that needs replaced. Again, aside from these minor inconveniences, we were very satisfied with our stay overall and would return and or recommend to others. This was our third time to stay in this unit over the past 25 years or so. We love the condo. Always clean, everything works, comfortable, live-in ready with all the nesessities promised. A grocery store is just down the street! Quiet, convenient location, but still close to all the fun of Branson! I do recommend that a new bed in the master suite would be a great help! Mattress is somewhat uncomfortable, and the sheets will not stay tucked in. I should have brought my own pillow. We love the view of the golf course, and the beautiful ducks on the pond at hole #2 keep us entertained. We really enjoyed our stay and will mark this one down for a return trip!! Hi, Mark! Thanks for taking the time to write us a review. We're very glad to hear your stay at Take a Holiday was an excellent one. We can't wait to see you again, and we have a special returning guest discount here for your next Branson vacation! It was a good place to stay with a good price and convenient location. The pool and recreation center are close and nice. It was easy getting to the place and the directions were easy for accessing unit. The only complaint was the very musty smell of the unit. It was a little overwhelming when first walked in each time. Hi, Kevin! We're happy to hear that Take a Holiday was a fitting second home for you. We hope that we can see you again soon, and don't forget to mention your previous stay with us for a discount on your next Branson vacation! Spent 4 days in this condo while visiting Branson for a baseball tournament. This unit was extremely clean and well organized. It is very conveniently located to the indoor pool as well as one of the outdoor pools and tennis courts on the property. Right next to the indoor pool is a great activities center with movie rooms you can reserve. You can bring your own DVDs or choose from the hundreds that they have. Other indoor games (ping pong, air hockey, arcade) and a snack bar are located inside the game room. My only dissatisfaction was the tiny thin bath towels that were provided, everything else was great. Hello, Karin/ Thank you for your review! We're very happy to hear you had a nice stay at Take a Holiday. We will be sure to mention the towels to the owner. We hope to see you again in the future, and be sure to mention your stay with us for a special returning guest discount! Hi, Courtney! We're glad that you had a good time at Take a Holiday. We can't wait to see you again, and remember to mention your previous stay with us for a returning guest discount when you're ready to return! We wondered when we chose from 10 different units if this WAS indeed the one we had rented several times, several years before. It is. we were delighted. good location, always clean and kept up. honestly, my husband has back trouble and after a night, remembered that the bed (especially in the second bedroom - not the master) was hard on his back. if anything would get upgraded, that might be one thing. I also have slept in it with no problem. he likes a hard mattress. Hello, Joy! We're so glad that you stayed in the unit you loved all those years ago, and that you enjoyed your stay this time. Thank you for your feedback on the mattress. We hope that we'll see you again soon, and of course we'd be happy to give you a returning guest discount on your next stay. We stayed here with our 4 children (ages 10-16 years) and had a nice relaxing time. The condos are a bit outdated, but clean and sufficient for a 4-5 day quick get away vacation. Master bedroom sheets looked dingy/worn and more pillows and towels would have been nice. Lots of games and movie options (mostly VCR tapes and some DVDs) were available, but we brought our own (and you can rent at the club house). We had a good time and it was quiet - we were gone for most of the daytime and just returned to sleep and eat breakfast. The pool is very nice and large - kids enjoyed it. Clubhouse gym was sufficient and in use daily, mostly during morning hours. The attached game rooms & movie rooms looked nice - though we did not use them. Golfers were out on the course. The condo was great. Nice and clean with everything you need. The bedrooms were big. Very comfortable place to stay. Love the area and the indoor pool. The condo was clean and spacious. Only complaint is that we wanted the pool to be open a little longer (maybe 11:00 pm). The kids like to swim, but we felt we had to hurry back from activities to get the swim in. We enjoyed our short vacation very much and the condo was very comfortable. Thank you very much. This was our second time to stay here. The first was several years ago. In the exact same condo! It was very clean, comfortable, and fully equipped with the necessities. Loved the view of hole number three on the golf course! It was like being in the gallery at PGA, minus a few pros. We sat on the balcony and watched the mallards waddle back and forth to the pond between foursomes. Beds were clean and comfortable. Kitchen had all the supplies we needed for comfortable dining. With a grocery store just down the street a bit, we enjoyed dining in after a long day of travel, and after seeing the sights of Branson. Our only trouble was with the code system at the front gate. Instructions were confusing, and nothing we tried would work. Thankfully a resident gentleman let us in with his card, and at other times, we were able to follow close behind another vehicle. (Although this was against the rules). My only regret is that we could not stay longer! Will be returning again! We have stayed several times in condos along the course. We sincerely loved this unit. The view was perfect to watch golfers play hole "2". Loved it. We do hope to return! We truly enjoyed our stay at this condo. Great property. Very clean. Very well equipped in the kitchen and rooms. Even had a couple tennis rackets and golf clubs that could be used! Location was awesome- right across the street from the swimming pools and arcade room. Highly recommend. We will surely be back! ?? Very clean and a good location to activities in Branson, Rental was very spacious and quiet. Had a large pool, which our family enjoyed greatly. Would highly recommend staying there to everyone. Exceeded expectations. It was the first time I had rented a property and had stayed in hotels in the past. The people were great, the apartment exceeded expectations and the location was as promised. Good condo to rent while in branson. A little dated but still nice. Once a year we take a family trip with just the siblings and my mother. Nine days before we where to go my mother passed away, but we decided to go anyway and spend time with each other. It was a good place for use to get away and be together. The pool area outside was nice and also quite. The Condo was great and homey. During our difficult time it was a great place to be together. very nice accommodations would stay here again a few things needed tweaking . A cord was missing for the electric fry pan. Had a great time, two years in a row. The condo was very spacioius with a great view of the golf course and ducks on the pond. We liked the location because it was very close, but not right in Branson. There was a grocery store and at least one pizza place close by. We where very happy with the condo. Very clean and very nice. Thank you for the review, Kathy. We hope you'll come back soon! Thanks, Austin. We hope to see you back in Branson soon! This is our second year to rent this unit. Hope we can rent again this next year. Great to see you back again, Neal. Hurry back! We had a wonderful trip. The condo was wonderful this is the second time I have stayed at this one unit. Hope to stay in it again. Everything was clean and very comforted.Thanks again. Good to see you back again, Marie. Glad you enjoyed your stay! Made our stay in Branson "easy." It's a great day when you can stay in a place and come away from the experience with absolutely no complaints. Thanks, Denise. We are glad you had an enjoyable stay. When you return to Branson, be sure to mention that you have stayed with us before to receive your Repeat Guest discount. We hope to see you back soon! Overall fine, but gate entry key needs serious work. Often had to enter the code five or six times to get the gate to open. Sometimes helped those in front of me with the same problem. Never had that at other places. Thank you for your review, Terry. The entry pad at The Lakes has been an issue that we have addressed many times with the COA at Holiday Hills. Since this is a Condo Owner's Association, Sunset does not have the authority to have repair work done. To lessen the frustration of trying to get the gate open, we have started sending alternate route directions to guest which bypasses the gate altogether. We hope that this will help guests staying at these condos. This Take A Holiday Rental is nice but when we checked in, the bathroom in 6A was not clean - there were hair tufts on the carpet. Also, the toilet in that BR did not flush well and it ran sometimes and did not shut off.Also, the Holiday Hills Gate key pad did not work most of the time. I called Sunset Rental's Office on this numerous times. I inputted the proper code according to the Rental Packet and the gate did not open. We had to wait until another resident came to the gate behind us (condo owner with a card) and then the gate would open. A couple of times, we had to go in the other gate to the South, and go the long way around the golf course to get to our Unit.Also, I rented an additional Unit (Rolling Meadows) early in the year for our other family. I was called on May 21st by Lacy and I was told that this Unit had been taken off the market and would it be OK with me if this Rental was moved to Building O (Serendipity). I asked if Building O was close to our Building D and Lacy assured me that it was. I then said OK to this rental change. When we checked in on July 20th, we discovered that our Building D was not close to Building O and Building O (my second Rental for my other family) was far away from my Building D. This was all misrepresented to me and we are not happy about how this turned out! Other than the above, our rental experience with Sunset Rentals was a good one! The beds were very comfortable! Thank you for the review, Bates and I apologize for the misunderstanding about the location of the condos in relation to each other. Rolling Meadows was also in Building O so Laci thought you were asking about the condo location of the unit you would be moved to in relation to Rolling Meadows. We have addressed the issue with the gate with the Holiday Hills Condo Owners Association many times and they have had it worked on numerous times. Unfortunately, since this is the COA's gate, we at Sunset have no control over getting the keypad fixed correctly or replaced. Since our guests have been having issues with this, we are also including the directions to the units through the other manned security gate if guests are unable to get the gate to open. We are sorry for the inconvenience but this is the only work around we have at this time. Thank you for your review, Richard. I have asked my operations supervisor to address the cleanliness of the pots and pans with the housekeeping staff. Also, there should have been another roll of paper towels for your use out so he will address this also. The check-out times were a decision made when we started Sunset. We had to decide between having an early check-out time or a later check-in time in order to give the housekeepers plenty of time to clean the condo prior to the next guest's arrival. We do offer a late check-out option for 25% of the daily rental rate but this is based on availability. Every morning the sprinklers would come on blocking our ability to leave the unit without getting wet. One of the railings, which was reported, is very loose and creates a dangerous hazard.